Cuban revolutionary leader Fidel Castro revived old enmities with the United States as he celebrated his 90th birthday on Saturday, skewering Havana's Cold War foe for its repeated attempts on his life. Castro, who retired from public life in 2006 due to ill health and appointed his brother Raul in his place, criticized US President Barack Obama for failing to explicitly apologize during his historic visit to Japan in May for Washington's decision to drop the atomic bomb. "The US president's speech in Japan lacked the words to apologize for the killing of hundreds of thousands of people in Hiroshima, even though they (the United States) knew the effects of the bomb," the ex-leader said in an article published by official media. Castro condemned as "equally criminal" the bombing of Nagasaki three days later on August 9, 1945. "That's why you have to stress the need to preserve peace and that no power has the right to kill millions of people," Castro said. Castro recalled his own youth and confrontation with the United States while he headed the communist island. "I almost laughed at the Machiavellian plans of US presidents," Castro said in the article published late on Friday. According to Cuban intelligence services, Castro faced 634 plots between 1958 and 2000. Several of those have been substantiated by US officials; some reportedly involved slipping poisoned or explosive cigars to the cigar-loving Cuban leader. Castro's brother Raul restored diplomatic relations with Washington last year. Castro warned in his article about the risks of global overpopulation, calling it "the greatest threat in the history of mankind." He singled out China and Russia as "great powers that cannot be subjected to threats of deploying nuclear weapons." 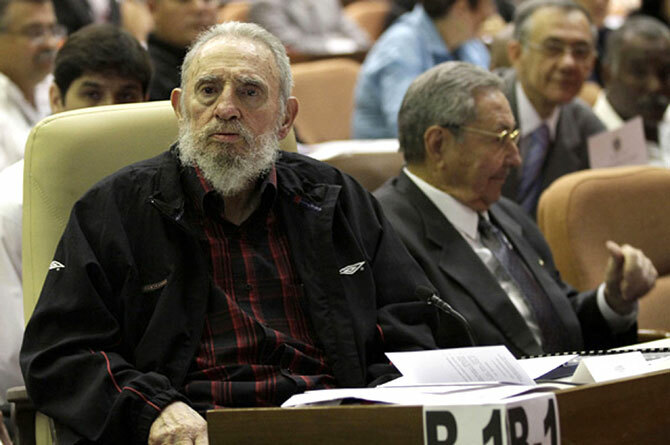 Castro was last seen in public on April 19 at the close of the Cuban Communist Party Congress. Dressed in a blue tracksuit and speaking in a trembling voice, he seemed to say goodbye. "Soon I'll be like all the rest," he said. "Everyone's turn comes." After Barack Obama visited Cuba in March, Fidel Castro recalled the island's long enmity with the US, including Washington's backing for the failed invasion of Cuba at the Bay of Pigs in 1961. His bitterness over that botched CIA plot played a part in pushing the world to the brink of nuclear war during the Cuban missile crisis the following year. The Soviet Union agreed to his request to send ballistic missiles to Cuba, and removed them only after a tense standoff with the United States.